Wow, September has quickly come and gone. I’ve barely noticed the month that ushered in the Christmas season. Yep, in the Philippines, Christmas rolls in as soon as the month of the year begins ending in “-ber”. So, let me be the first one to greet you ‘MAAYONG PASKO!! !’ (that’s MERRY CHRISTMAS in my dialect). September was a very hectic month for me. I came back from the Philippines just a week and a half ago. My trip lasted for a little more than 5 weeks. I wish I can say it was a vacation, but it wasn’t. If you are unaware of the circumstances why I went home, just check out my previous blog here and here. For the past two years, I’ve had a total of 5 trips to the Philippines. You might say that I should be jet-lag proof by now..but nah. I don’t think our body is ever going to get used to the stress of 30+hours travelling time, not to mention that your air flight spans across the equator totaling 13,000 miles of distance. Thankfully though my body has become resilient to this change, and I’m coping up better and better with the jet lag. So I’m almost back to “normal” now. As always, it’s hard to leave your homeland behind, especially if you have aging parents that you care for. Regardless of how many times I’ve come and gone, it hasn’t become any easier, especially since my father has become a widower, and is now handicapped. However, I was at peace to leave him behind, knowing that his health has improved a lot since his hospitalization and that he is being taken cared of very well. He is certainly much better than he was a month ago, albeit, missing about ¼ of his right leg. My father’s recovery I consider yet another miracle in our lives. Once again, the Lord is amazing in His faithfulness. In time of need, He has never failed to bless us through friends and family. To all those who have supported us in prayers and finances, may God indeed return the favor to you a hundredfold. September also marked my mother’s 1st year death anniversary, September 20th to be exact. While I was in the Philippines, my family and I had a chance to commemorate her death. We had a sort of a small family reunion that day. It was wonderful to see a lot of my relatives again. But while we all miss my mother in one way or another, there is a great reassurance in our hearts knowing that she is indeed in the best place she could be – in heaven with Jesus. Halleluiah! Shortly after this, another tragedy struck my family. On Sept. 25th, a cousin of mine passed away due to colo-rectal cancer. At 51, one would say that he was still young. He discovered that he had this terminal disease only in August last year, but at that time, cancer had already spread to some of his vital organs. 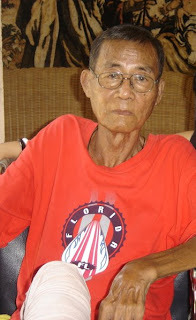 He was based in Long Beach, California and was flown to the Philippines to spend his last days there. But he took his last breath immediately the following day after his arrival from the U.S. He must have just waited until he was home. So you see, September was an eventful month filled with victories interwoven with trials. God doesn’t need to create tragedies in our lives to achieve His purposes, but I am so glad that He can use the negative circumstances we are in and turn them around for His glory. In all things and at all times and in every way, I give Him thanks and praise. God is good. He was, is, and remains to be, worthy of all our praises.